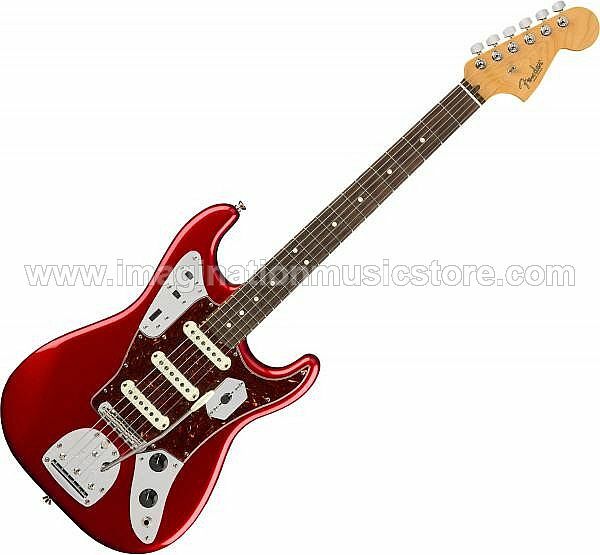 Combining the snarling tone and versatile switching of the Jaguar with the classic feel and sonic prowess of a Stratocaster, the Fender Limited Edition Parallel Universe Jaguar Strat packs a ton of appeal for Fender fans. Three American Vintage '65 Jaguar single-coil pickups pack all the bark and snap you'd expect from a '60s Jag, while the switching scheme has been updated to offer unique sonic potential. And for the first time ever, this Stratocaster body is equipped with a Jaguar/Jazzmaster floating vibrato, which guitarists at Sweetwater know is perfect for surfy warbles and bends. It's sure to be a hit with collectors, but as soon as you plug in the Fender Limited Edition Parallel Universe Jaguar Strat, you'll know it was designed to rock out. Loaded with a trio of American Vintage '65 Jaguar single-coil pickups plus a 5-way position switch, the Limited Edition Parallel Universe Jaguar Strat will be familiar to fans of Jaguars and Stratocasters alike. Its control set is unique, though, starting with the thumb-wheel tone control that is dedicated to the bridge pickup — perfect for taming that position. The remaining tone knob governs the neck and middle pickups. Two upper-bout switches allow position three to select either the middle pickup alone or all pickups at once for explosive tone.